The Jean Stewart Trophy was decided upon after the sudden death of Jean Stewart in January 1976. The Youth Leaders met to decide on how this trophy should be awarded. They agreed that the event should be comprehensive and tough. It was to be a coveted award to which only the best of the youth could aspire. In 1977 & 78 the Jean Stewart Memorial Trophy Competition was held at Roberton – the winner was the best camper. In 1980 the Competition was organised by Dave Batty at Ardgarten, which was orienteering. In 1981 it was decided that as Jean Stewart was a backpacker and walker that the Youth would complete 5 x 20 mile hikes in the different DA areas. 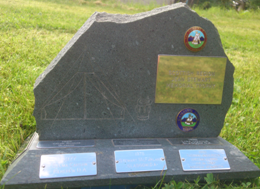 A pennnon is given to all Youth who complete the walk and the Jean Stewart Memorial Trophy is awarded to those Youth that have completed all 5 walks. Jean Stewart herself, was a rough camper and although she had reached the age of retirement, was still backpacking and camping. A founder member of Renfrew and West of Scotland DA. She held about every position on the committee, latterly she was the Chairman. She was identified with the Scottish Region since its inception and was also its most effiecient Secretary to the day of her death. She had great enthusiasm for the young camper and would encourage them to get the best of camping and the outdoor life, climbing, tramping, ski-ing, canoeing, youth hostelling – she was an authority on them all and also a world traveller, having camped in Ethiopia and been on safari to Russia.